Don Cheadle in "Miles Ahead." It's been only a matter of weeks since the release of "I Saw the Light," a film that once again demonstrated the creaky limitations of the biopic template, and we've already got another tale of tortured musical genius on our hands with "Miles Ahead." In the film, Don Cheadle creates a fascinating, if not wholly successful biopic of jazz legend Miles Davis. A passion project for Cheadle, the actor directs, produces, co-writes (with Steven Baigelman, who received a story credit for another rule-breaking biopic, "Get on Up") and stars in the film. Thankfully, with his first feature as director, Cheadle does everything he can to buck the pattern of the stale biopics that came before, and creates a free-form narrative which feels true to the spirit of both the man and his music. Jumping around in chronology, "Miles Ahead" splits its time between two major periods in Davis's life. The first picks up in 1979, when he begins making new music after a long, self-imposed hiatus. He's a drug-addled hermit when a Rolling Stone journalist, Dave Braden (Ewan McGregor), knocks on his door. Eager to capture Davis's comeback story, the writer plies him with cocaine when the musician proves resistant to spilling his guts. Early in the interview, Braden insists that he's not interested in the standard subject of such profiles, asking Davis to skip over the usual anecdotes about drugs, women, and the source of his creativity. Cheadle mostly adopts a similar attitude toward the material, taking his story in unexpected directions. It's during this section that the film gradually morphs into a buddy crime caper, with the pair attempting to wrest Davis's stolen session tapes from the clutches of the unscrupulous manager (an underutilized Michael Stuhlbarg) of an up-and-coming trumpeter (Lakeith Lee Stanfield). By the time the duo are getting into car chases and having shootouts with one of the manager's hired guns, you start to wonder how exactly we got to that point. The film's other narrative takes place 20 years earlier, chronicling the musician's tempestuous romance with Frances Taylor (the wonderful Emayatzy Corinealdi), the dancer who would eventually become his wife. While this section treads into more conventional territory, the performances help alleviate some of that sense of familiarity. 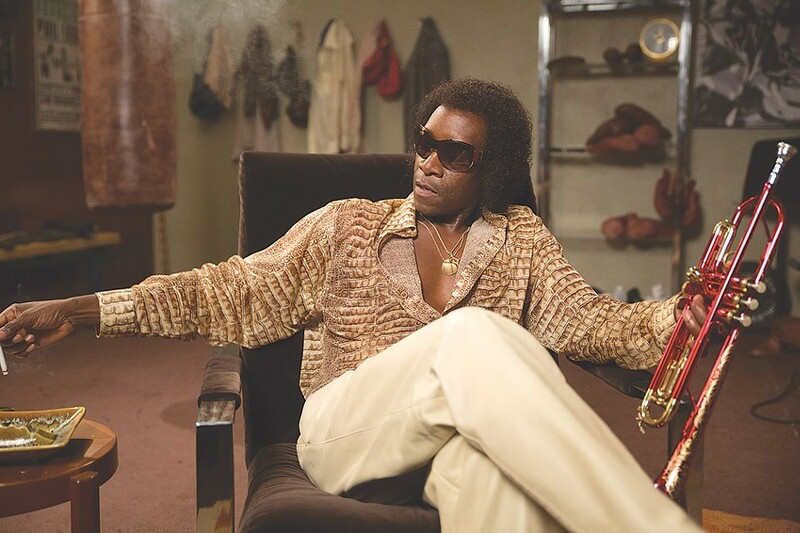 Cheadle is electric as Davis, slipping into the larger than life personality with a cool swagger that comes through even when he's at his most desperate. The actor gives a predictably strong, charismatic performance. Cheadle also demonstrates considerable talent behind the camera, but despite his best efforts, the genre gets the better of him; something about documenting creative genius seems to befuddle even the most talented of filmmakers. The bifurcated structure ultimately doesn't leave us with a complete portrait of the man. Admittedly, this may be because when faced with the prospect of turning in a traditional biopic, Cheadle instead opted to leapfrog over the clichés by simply inventing a more interesting story to cover; the majority of the storyline with Braden (including Braden himself) is entirely made up for the movie. Just as the artist bristles when the journalist refers to the music he makes as "jazz" -- Davis insists that the writer call it "social music" -- so too does Cheadle work to avoid letting his film fall into those easily defined categories. He draws a clear influence from blaxploitation films of the 1970's, and there's more than a little "Super Fly" to those crime sequences. And while the details may not be accurate, it does make for a wildly entertaining ride, and honestly that counts for a lot. In the end, "Miles Ahead" is all the more fascinating for its flaws, and Cheadle's unconventional choices hint that he has instincts that could make for an interesting career behind the camera. He adds stylistic flourishes that give the film a propulsive, unpredictable energy that's as bold and dynamic as Davis's music, finding ways to cleverly transition between the timeframes, like when the back of an elevator pushes open to reveal itself as a doorway to the past, and one exhilarating sequence in which the two timelines suddenly bleed together at a boxing match. Editors John Axelrad and Kayla Emter are key in creating the film's jazzy, improvisatory feel. As a filmmaker, you can sense Cheadle's passion for the material behind every frame, even when he sacrifices authenticity for sheer entertainment value. The film doesn't quite come together, but when films like "I Saw the Light" are still being released, Cheadle deserves credit for taking a chance.